Today I thought I’d step away from the apples for a moment to share a truly de-luscious recipe. I hope you are all still riding on that pumpkin bandwagon with me because this one is really going to flip your little pumpkin lids. It is the most smooth, creamy, pumkin-y, pudding-y, autumn-spiced, breakfast-disguised-as-dessert to ever grace these pie-loving lips! I mentioned pumpkin pie in my autumn food musings the other day, because it’s been on my mind lately. In a couple of short weeks, many of us are going to be bombarded with a plethora of decadent desserts at the end of our nap-inducing feasts. While I certainly plan to indulge in a dessert or two this Thanksgiving, this recipe is for the times that I have a hankering for a sweet treat but I don’t want to overwhelm my body with sugar, oil, and refined carbs. Instead, this pudding-like porridge will provide your body with a variety of vitamins and minerals, while filling you up and satisfying your pie cravings. It’s delicious as a snack or dessert, and not too sweet for breakfast. 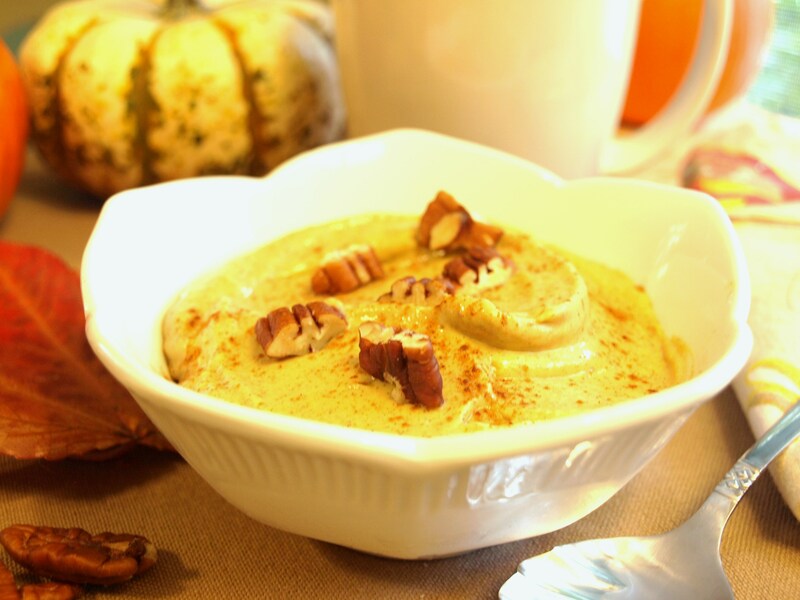 Think of it as a magical pumpkin pie pudding that will power you through your morning and provide your body with an abundance of essential nutrients to look and feel your best. If you’ve never tried a raw buckwheat porridge recipe, I urge you to literally give this one a whirl. Especially if you’re a fan of pumpkin everything. I originally bought a package of raw buckwheat groats so I could grind them into flour and use it in baked goods. Then, I started seeing recipes calling for soaked, raw buckwheat, that you blend into a creamy porridge. Once I tried it, I was hooked! It was the only way I could think of enjoying this hearty pseudo-grain for a while. When the pumpkin craze struck, I knew I had to try it in the pudding, along with a generous sprinkle of pie spices. It took a few tries to achieve the level of pumpkin-y flavor that I was dreaming of, but the effort was definitely worth it. Layer the pumpkin pie porridge/pudding with coconut yogurt and granola for an easy and delicious dessert-like breakfast! Unlike most of the buckwheat porridge recipes I’ve tried that use almond milk or juice, I decided to keep things as whole as possible and use soaked cashews instead, resulting in a pudding that is super thick, creamy, and smooth. Raw cashews are an excellent source of healthy fats. Over 80% of the fat in cashews is unsaturated, and almost 70% of that is heart-healthy monounsaturated fats. In addition to reducing triglycerides and improving our cardiovascular health, these fats also help keep our skin hydrated and may reduce inflammation and acne. Cashews have an impressive amount of copper, providing 98% of our daily value in just 1/4 cup. Copper is important for all kinds of good things; it helps our bodies use iron, eliminate free radicals, build connective tissue, strengthen blood vessels, and produce the pigment in our skin and hair. Not only do foods rich in copper help prevent anemia, osteoporosis, and joint problems, it is also a key mineral for maintaining younger looking skin by restoring elasticity and firmness. Cashews are also an excellent way to get your daily dose of magnesium. In addition to strengthening bones, magnesium helps control nerve and muscle action. Magnesium deficiency can lead to migraines, high blood pressure, tension, and muscle cramps. If you want to get technical, this porridge is not only gluten-free, but grain-free as well. Buckwheat is neither a type of wheat, nor is it a grain. If you know your buckwheat trivia, you’ll know that it is actually related to rhubarb, and it is the seeds that we eat. Just like cashews, buckwheat is a great source of magnesium and copper. Researchers have found that diets that are high in buckwheat are associated with a lower risk of high blood pressure and high cholesterol, partly due to the flavonoids they contain. Buckwheat has also been shown to lower blood glucose and insulin responses, and can help control blood sugar. In addition to being a high quality protein (it contains all eight essential amino acids) it has also received high scores when it comes to satisfying hunger. If you read my pumpkin post, then you already know all the health and beauty boosting benefits of my favorite orange squash, and why I made sure to add a decent amount of it in this recipe. The chia seeds provide additional protein, as well as fiber, iron, and omega-3 fatty acids. Furthermore, this porridge is sweetened only with dates, so no sugar crashes here. Because this recipe uses a little less than half of a can of pumpkin puree, you’re going to have some leftover pumpkin. You’ll have enough for at least four mugs of dreamy, soothing pumpkin chai steamed milk , plus some to spread on your face for a relaxing autumn spa day! Or you could double the recipe to ensure you get your fill of this amazing porridge; whether it’s breakfast, snack, or dessert! I hope you enjoy it! 2. Blend, starting on the lowest setting and gradually increasing the speed to high, until smooth. Taste, and adjust spices if desired. Pour into two small bowls, cover, and place in the fridge for an hour or two to set. 3. 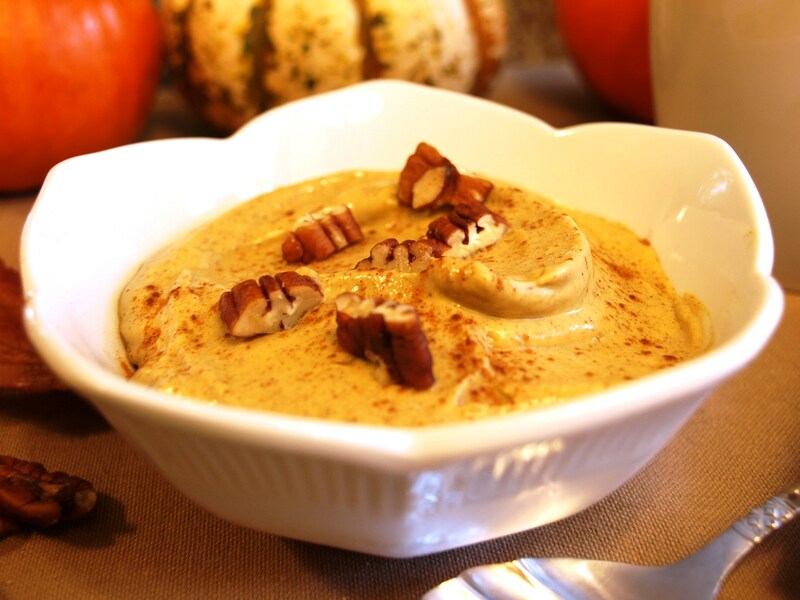 Serve with chopped pecans or dollop of coconut whip and dusting of fresh nutmeg. To make Pumpkin Pie Parfaits, simply layer the porridge with coconut yogurt or other plant-based/dairy free yogurt, or even coconut whipped cream. My easy homemade coconut yogurt is perfect here! The porridge will start out on the thinner side but thickens up nicely after an hour or so, thanks to the chia seeds. This is subtly sweet, if you’d like more sweetness you could add a small drizzle of maple syrup before serving.